One of Americas most colorful railroads in equipment and history. At one time she operated steam, electric and a multitude of diesel locomotives at the same time. Worn out by the trials of WWII, she never fully recovered. 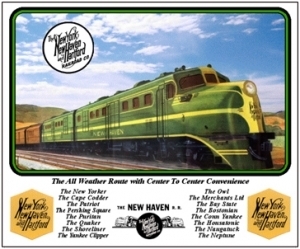 Featuring the New York New Haven & Hartford RRs beautiful Fairbanks Morse & Co. C-Liner streamlined passenger diesels. Features the New York New Haven & Hartford RRs EP4 electric locomotive. A monster of a locomotive. Featuring the New York New Haven & Hartford RRs dual service diesel and/or electric FL9 locomotive. These locomotives could operate in full diesel or full electric mode. 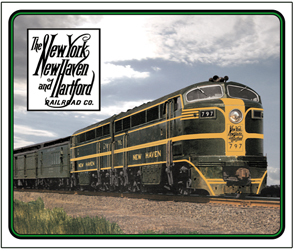 Features the New York New Haven & Hartford RRs red and black logo used on nearly every type of diesel/electric locomotive they used, up through the end of the line. 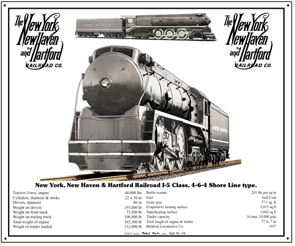 Features the New York New Haven & Hartford RRs famous script logo used on just about every locomotive up until the red and black logo. Pad features the New Havens Railroads Fairbanks-Morse C-Liner diesel. Pad features the New Havens dual service ALCO DL series diesels pulling The Merchant Limited. 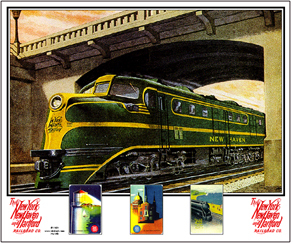 Pad has names of several NY, NH & H passenger trains with images of the road. Pad features the New Havens Class I-5 Shore Line Type, 4-6-4 streamlined passenger steam locomotive. 6 inch x 6 inch square tin last logo used by the New Haven Railroad. 6 inch x 6 inch square tin round logo used by the New Haven Railroad. 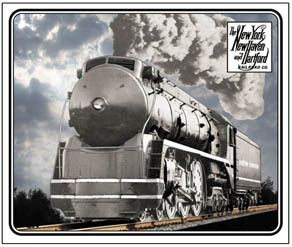 Reproduction & enhanced tin sign depicting a New York, New Haven & Hartford Railroad DL109 diesel locomotive. New Haven railroads fast, streamlined and powerful 4-6-4 I-5 class, Shore Line type passenger locomotive is featured on this 10x12 metal sign. 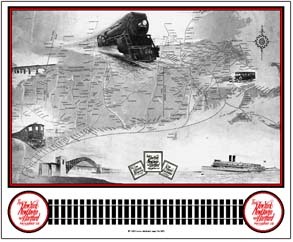 Circa late 1920s map of the New York, New Haven & Hartford with vignets of steam, electric, motor coach, Hells Gate Bridge and a steamship. Logos of the railroad, New England Steamship and New England Transportation are featured, all owned by the NH.